It has now been two weeks (yesterday) since baby Oliver was born. Per my post last week, I’m letting you in to my journey to get back in shape via a plant-based lifestyle. 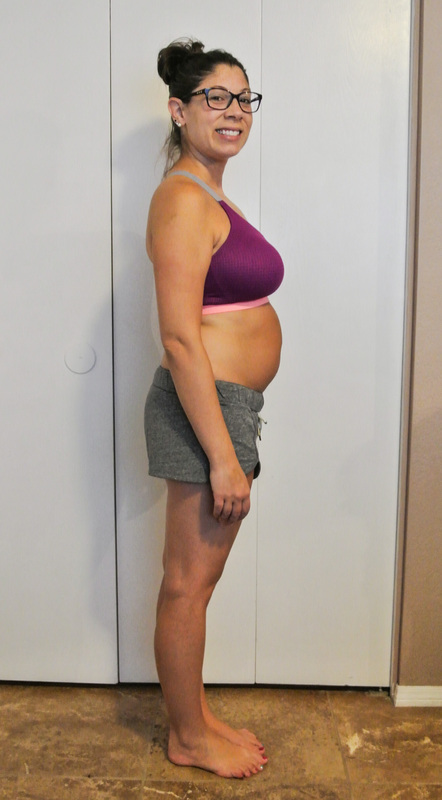 This week, I’m sharing a new progress pic, an assessment of my commitment to my personal goals, and my top clean eating tips. I’m now 131.5 pounds, down from 136 last week. I’m just five and half pounds (and some toning!) away from my pre-pregnancy weight and eighteen and a half pounds away from my pre-babies weight, which, as I mentioned previously, I may or may not ever hit. The body changes a lot after having children and that is not at all bad. I also believe that the numbers on the scale are not the only indication of wellness success. Overall, I’ve been sticking to my goals. I skipped my twenty-minute walk outside on my first day alone with both kids. Honestly, I was just too tired to chase around my two-year-old with my two-week-old strapped to my chest. This is ok; exercise should be a regular habit, but something that I can incorporate routinely into my day. If it doesn’t fit one day, I’m not going worried about regressing. Healthy eating comes easily to me, but eating regularly has proved challenging with the needs of the kiddos and exhaustion taking over my body. I’ve found that while I’ve made smart choices, I’m going too long between meals/snacks. I always make up for lack of eating early in the day later in the day, but I need to get back into the swing of grazing rather than gorging. I’m more of the six-small-meals-a-day type, rather than aiming for a structured breakfast, lunch, and dinner only. 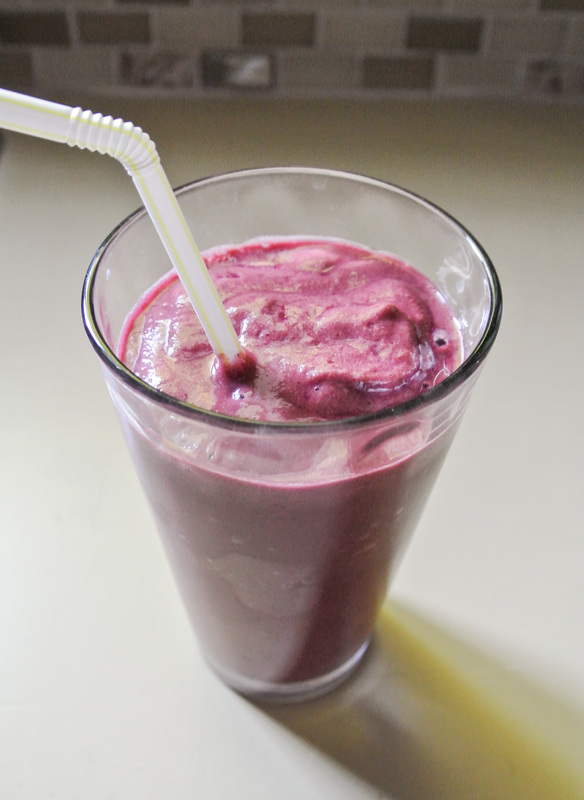 Smoothies help to keep me on track: meal in a glass! I’m also proud to report that I’m taking my own advice and making meal prep a priority. For the times that I just don’t have the energy to prepare a meal on the spot, I’ve got my family covered. 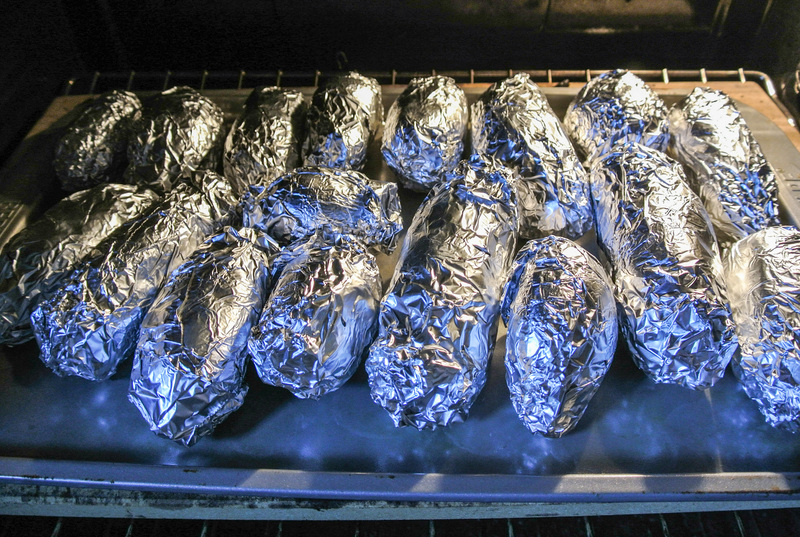 In addition to a huge batch of butternut squash mushroom risotto that Travis whipped up, we also baked a boat load of potatoes. Nolan scrubbed the skin clean (awww) and we dusted each potato with a small amount of olive oil and pink Himalayan sea salt before wrapping in foil. THIS is the way to keep the baked potato the nutrient powerhouse that it should be – sour cream and cheese are yummy, but seem to overshadow the high levels of vitamin C and fiber that the potato has to offer. Garden. 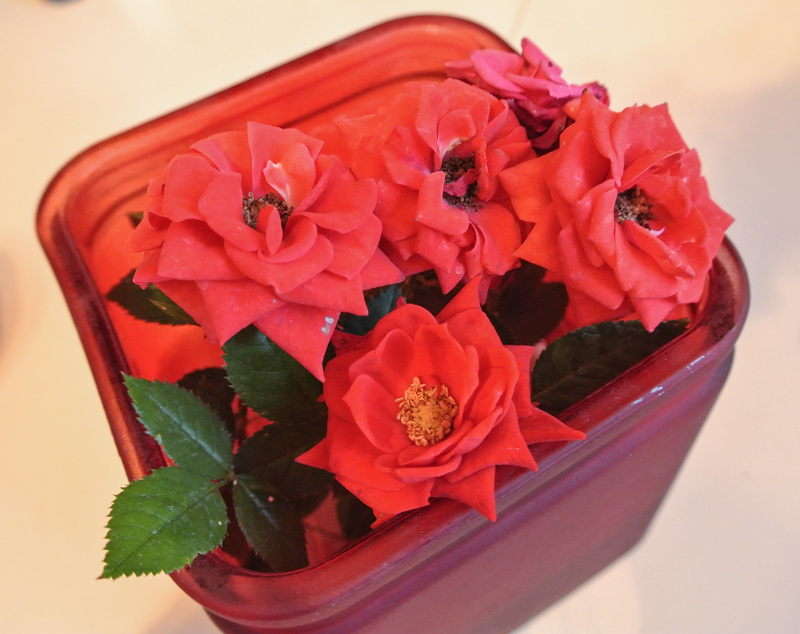 I’ve previously shared with you the steps to creating your own garden. While the startup is a task—buying gardening supplies, tilling land, planting seeds, and waiting for growth—the payoff is HUGE. We have saved so much money growing our own produce. These newly-planted beauties cost us $36 (even cheaper when we start from seeds) and will yield fresh herbs and vegetables as long as we tend to them. The flowers attract bees to keep pollination going, so we’ve got them in the backyard, too. 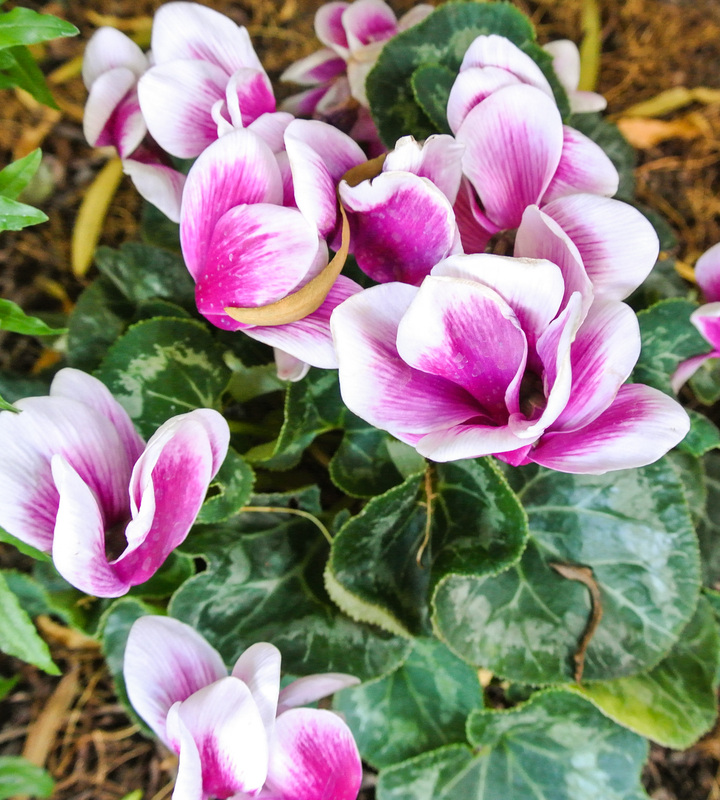 Gardening is easier than perhaps it looks and makes for a beautiful, fragrant addition to your property. We garden organically, of course. DIY takes more effort, but it saves money and guarantees a healthier product if you prioritize high quality ingredients. I recently read an article about a study on the cost of plant-based living. The study showed that plant-based living was cheaper than an herbivorous diet. While I doubt this is true for every vegetarian/vegan, it definitely is for me. If I were going to eat meat, I’d be going for grass-fed, hormone-free, etc., which is even more expensive than the already expensive antibiotic-laden variety. It pays—or at least, saves!—to eat plants…literally. Keep it simple. When I introduced my veggie wrap formula last week, I emphasized how important flavor and texture are to my palate. I’ve never denied that foods containing animal products can be absolutely delicious, so in order for plant-only versions to compare—and hopefully, exceed—they need to be loaded with taste and appealing in texture. What I’ve come to discover is that this doesn’t need to be complicated. The longer that I develop Fresh Formulas, the more that I rely on fewer and/or simpler ingredients to pack a big punch. I made this tomato salad for a snack today. 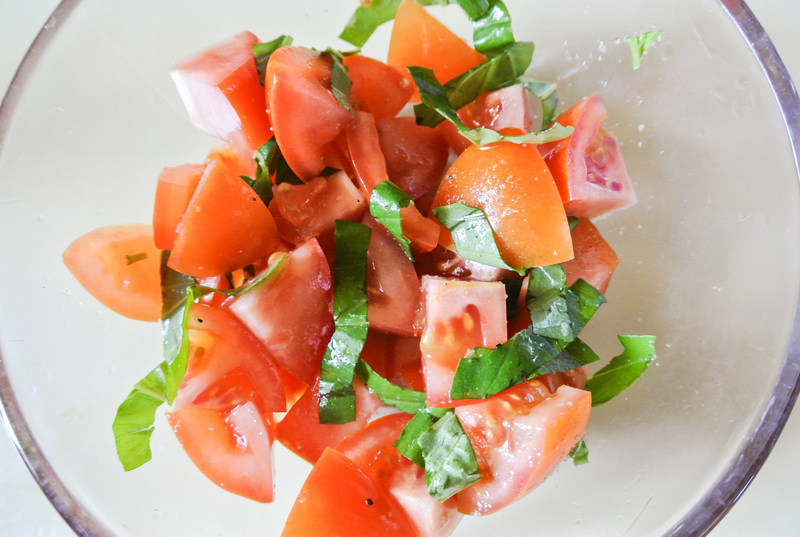 It contains roma tomatoes, fresh basil, lemon juice, and a pinch each of garlic powder, onion powder, fresh ground black pepper, and pink Himalayan sea salt. It was scrumptious and filling, and not in that I-ate-too-much-turkey way. Think about the food labels that you’ve seen. You should be able to recognize every item listed in the ingredients section. If you can’t, you’re not keeping it simple. Nature really has a lot to offer. Have you ever grown your own basil? 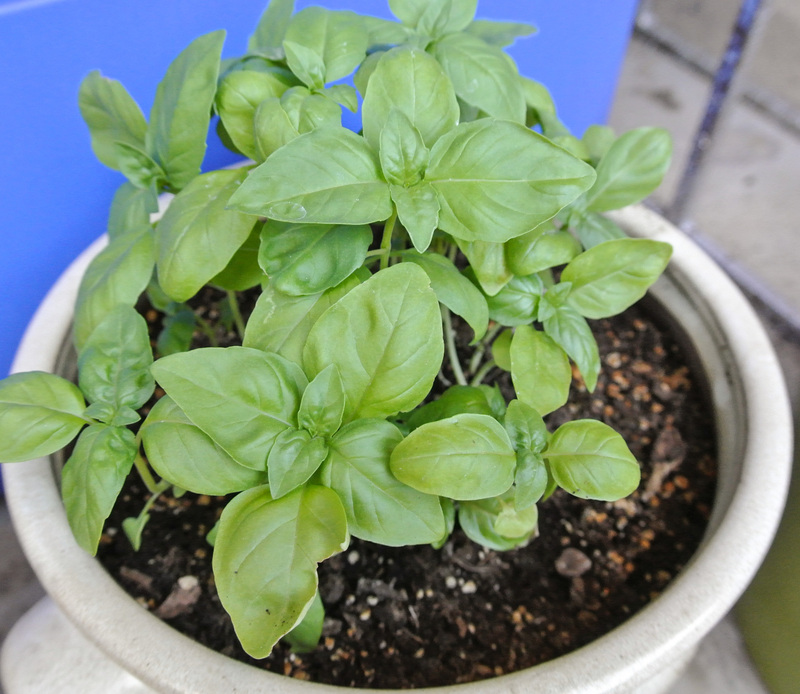 Even if you’re not ready to dive head first into gardening, invest in a small pot and plant some basil in it. Its smell alone is pretty darn amazing. It’s the very plant that Travis and I grew first and now we have an elaborate potted garden in our front yard and a traditional garden in the back. And, it’s simple. Here in Phoenix, temperatures will be over 100 degrees by the end of this week. This means the beginning of some summer crops, but the end of most, with temperatures eventually reaching the teens. Since I last updated you on our DIY backyard garden, we’ve had a few changes and one surprise. 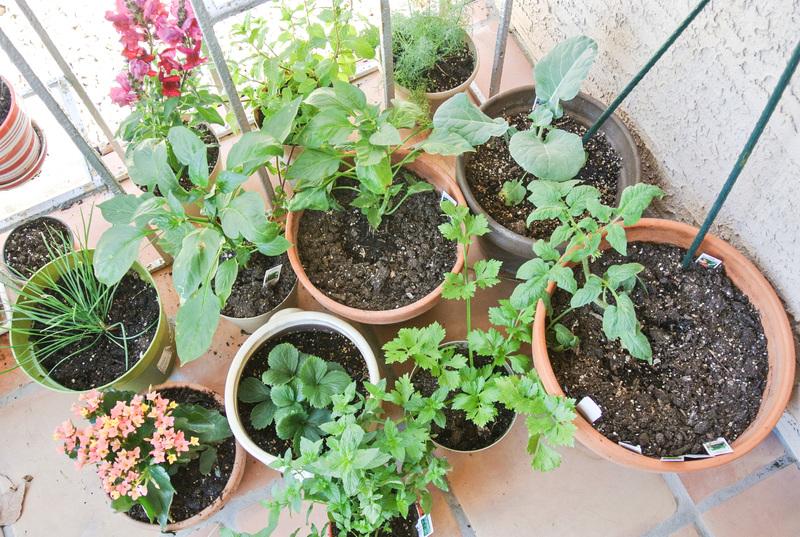 As previously mentioned, growing your own garden allows you to control the quality (i.e. organic, for example) and saves you money on purchasing pre-grown produce. Unless you’re an expert and/or have a ton of available land with extremely fertile soil and/or live in a region with perfect gardening weather year-round, you probably can’t grow everything that your veggie heart desires, but there may be a few items with which you can find success. Other than our extensive herb collection—which, unfortunately, is starting to take a beating from the heat—our biggest success by far is tomatoes. 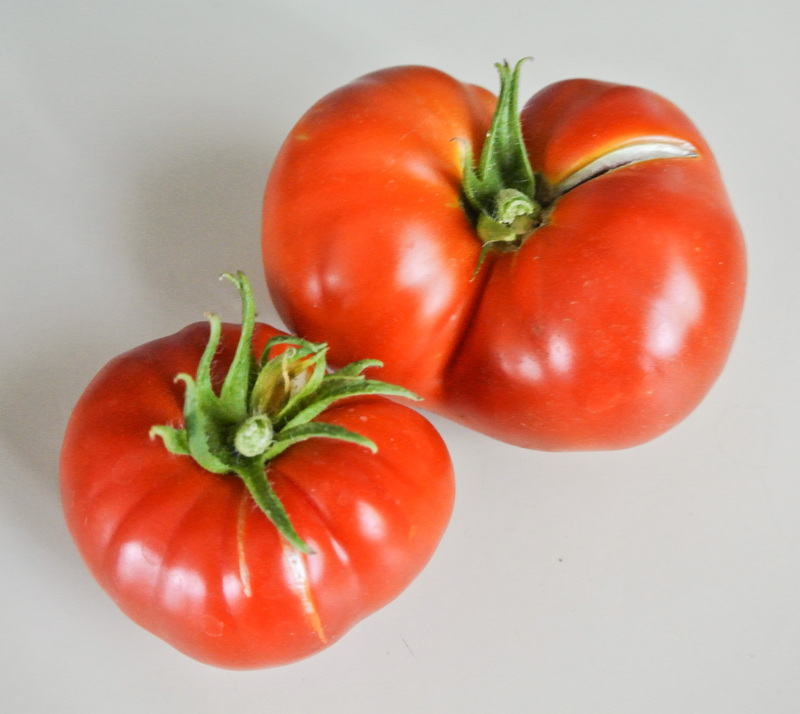 We have at least four different varieties (that we’re aware of) growing in our garden, including these gorgeous beefsteaks (pictured above). 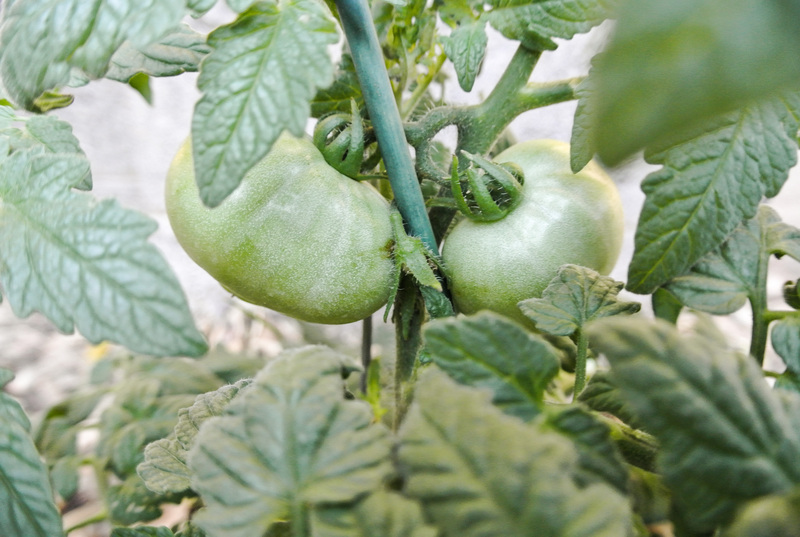 Our plants are holding strong as summer approaches and we have 40-50 fit-sized tomatoes near maturity, including some sweet yellows and black rim. We have a few baby yellow summer squashes and leeks, too. 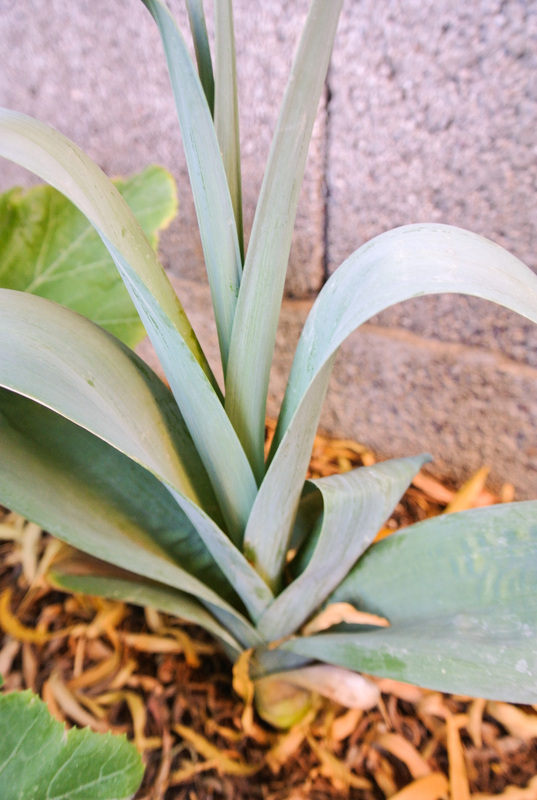 We received leaks in our Bountiful Basket one week and thought we’d try planting it; months later, it’s going strong. Other successes (not pictured) include continued growth of our pomegranate trees, shrub-sized rosemary and lavender, and lemongrass that’s been going for well over a year. We have about five ears of corn with a couple of kernels each and green onions that we planted over two years ago that just keep on giving. Surprise: We have wonderberries! It took us a while to research and name the mystery plant that has taken root in our yard, but we finally did it. 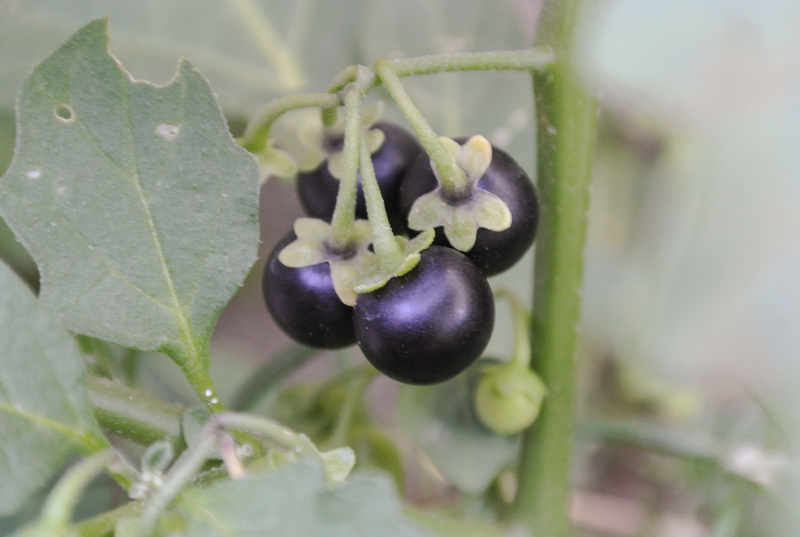 Wonderberries, sometimes referred to as sunberries, look similar to blueberries. When they are green, they are poisonous. Once they turn black, they are edible. When the skin goes from shiny to dull, they are at their best, but never quite as sweet as other berries. They are commonly made into pies or jams where extra sugar can be added. I’ll let you know when we harvest ours and make something out of them. Still feeling daunted? Again, start with windowsill herbs and work your way up to planting bigger crops. 🙂 Your organic palate and fuller wallet will thank you in the end! I am often asked how Travis and I make a plant-based lifestyle affordable. As I’ve mentioned before, although I spend less than I did in my omnivorous days, to purchase high quality, organic, GMO-free, all-natural, plant-based foodstuffs isn’t cheap, and that may be one of the reasons why more people don’t get on board. First of all, let me reassure you that we are NOT perfect at this and I’m sure that there are some deals that we miss, but we are pretty diligent and creative. In my post about Bountiful Baskets, I shared a few of the ways that we stock up and save for cheap. Sometimes, we make compromises. You can find lists in a number of places of the produce that is considered “dirty” if not purchased organic (we discovered one in a baby food cookbook ourselves). These, we don’t compromise on; if the organic version of grapes is not available, we don’t buy them. Other items, like bananas, we aim to buy organic, but if the organic is out, we will buy the non just because we love bananas so much and consider them crucial to our diet. When I buy something that is processed—almond milk, for example—I try to avoid the “big” brands that are known for using GMOs. The problem is, I don’t yet know what all of the those companies are, so I’m learning more and more each day that goes by. Travis and I maintain an all-organic garden in our yard. 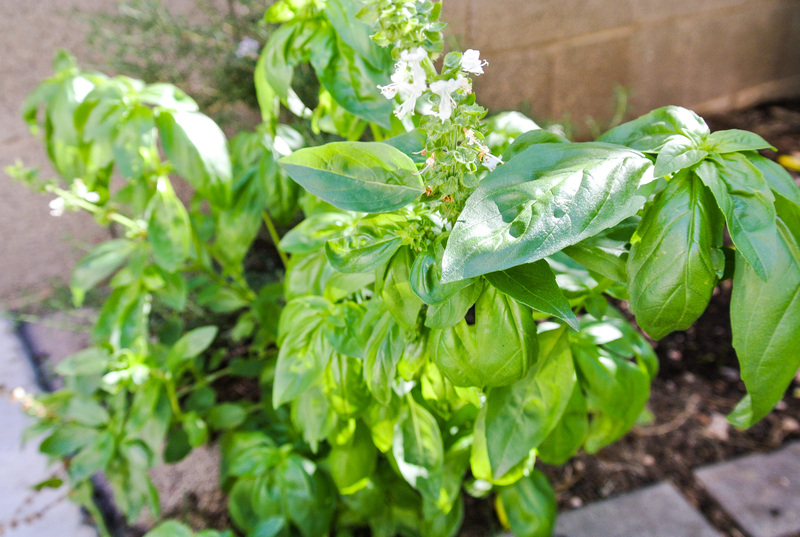 We started small—with fresh herbs (basil pictured below)—and grew to planting larger produce that takes longer to grow. We also have a compost pile in one corner from which a number of surprises have grown. 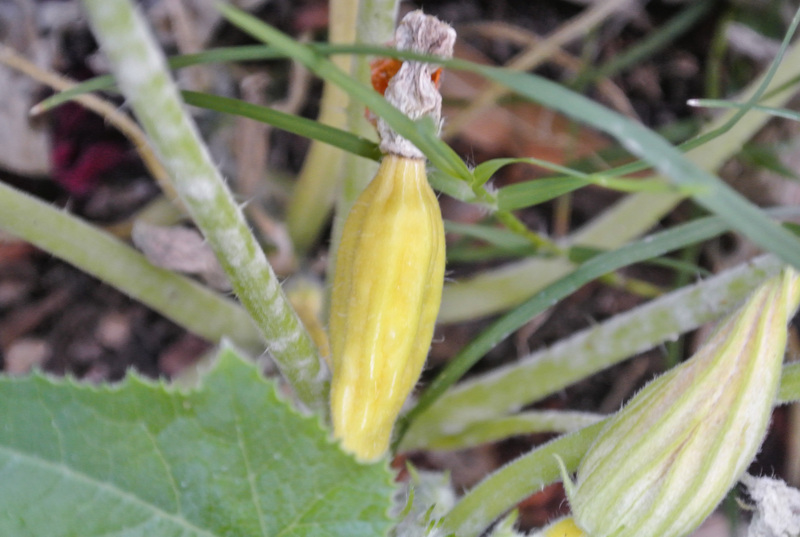 We once through butternut squash seeds out there and without even consciously tending or watering that area ate a few delicious squashes months later. If you’re interested in starting your own garden, begin with research. What type of soil do you have where you live? What grows best in it? In what season? Will you plant from seeds or small plants? Will you install an automatic watering/drip system or water by hand? How much shade vs. sun do you have available? What types of critters come through your yard that might help or hinder your garden’s growth? Do you have room for a compost pile? Do you have someone that can (and wants to!) tend to your garden if you go out of town often? 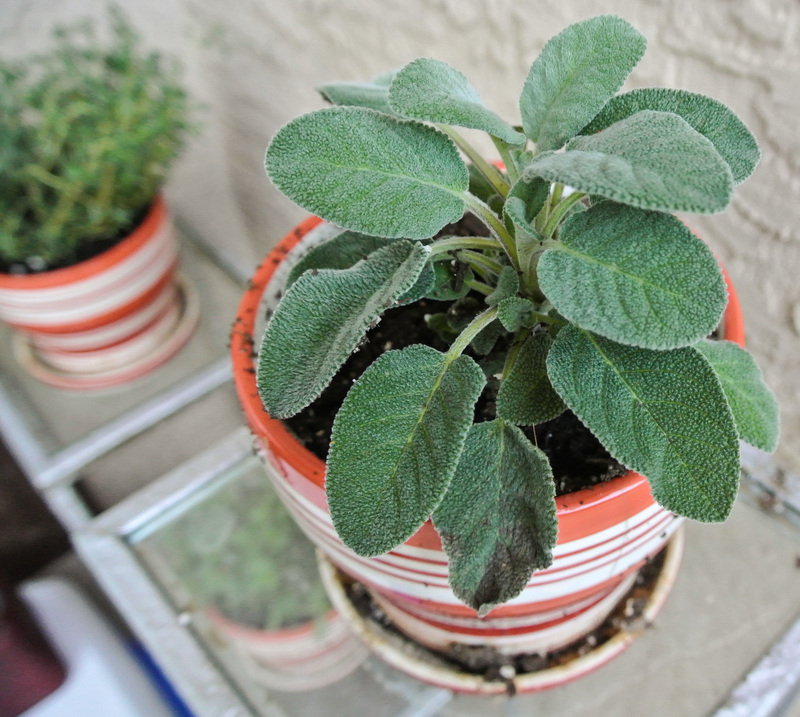 We started growing herbs from seeds in small pots in our house, just to get a feel for our gardening abilities. Hey, some people can’t keep a simple house plant alive, so we had to make sure we could do this before we committed. 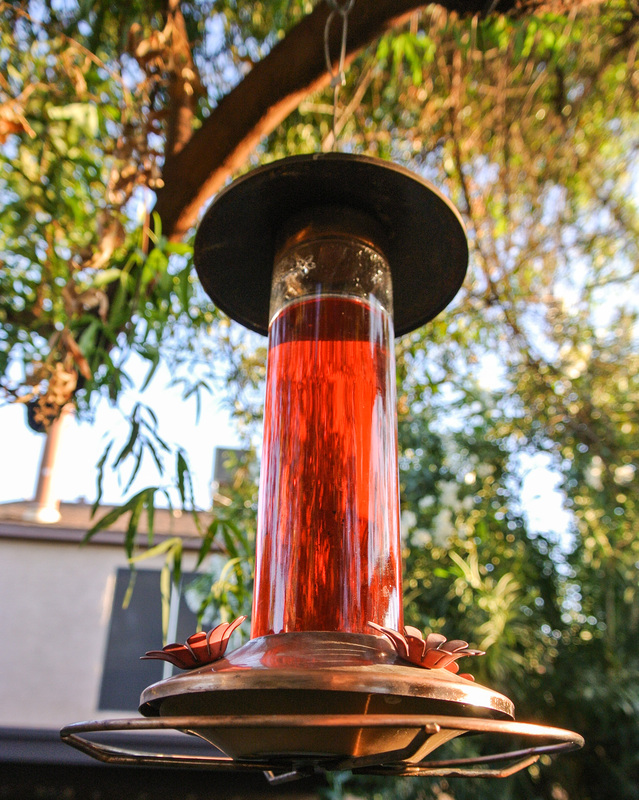 Then, we planted flowers and flowering shrubs and installed a hummingbird feeder to attract the birds and the bees. They are essential to pollinating crops and spreading seeds for new growth. Finally, we researched what crops grow best in Phoenix soil in various seasons and got to planting. Sometimes we start with seeds and other times small plants. The herbs that we started growing inside eventually grew big enough to be transferred to larger pots and then, to the ground. Since we started gardening, we have reaped nearly ten different herbs, cilantro and basil in particular in large quantities that come back on their own every season. We have also reaped tomatoes, cauliflower, kale, carrots, potatoes, squash, green onions, and lemongrass. 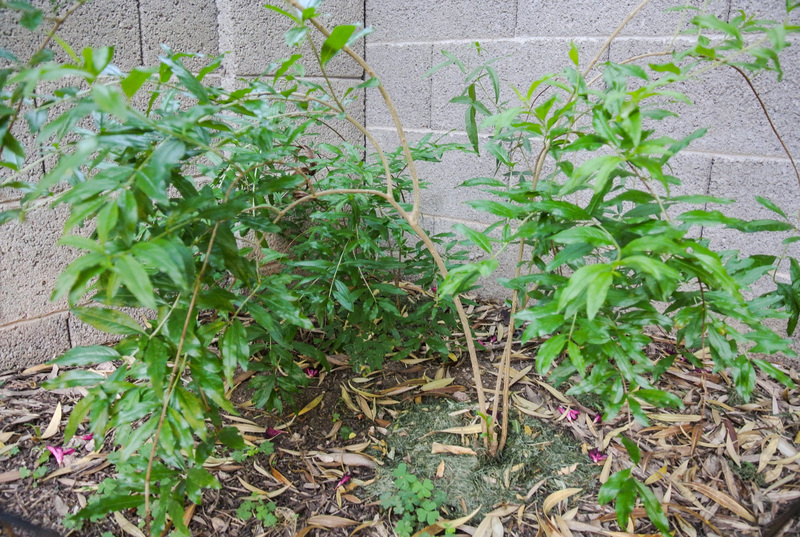 We have pomegranate bushes (pictured below…pardon all of the leaves that have fallen from our tree! Trav insists we let them stay once they’ve fallen because they trap moisture for the soil underneath, which is certainly critical in Arizona!) that are growing from a pomegranate that we opened and stuck in the ground. They are still years away from producing, but are going strong! Due to the increased influx of birds and bees, we have also seen the growth of new trees, shrubs, and flowers that we didn’t plant ourselves…they really hold up their end of the bargain if you provide them some pollen and sugar water! Our garden is evolving all the time and we have had plenty of failures, but we are getting better and better at it and have saved tons of money on herbs alone, which are quite pricy to purchase fresh in much smaller quantities than what we can grow ourselves. Don’t be daunted – start with windowsill herbs and build up. You’ll be growing your own organic produce and saving money in no time!